Investor concerns about a regulatory impact on Twitter are “overdone,” said JPMorgan analyst Doug Anmuth. Twitter relies more on non-sensitive data than it does on sensitive data, so it’s not terribly exposed to regulatory risk, he said. Anmuth gave a $US36 price target on Twitter, which has been hit hard of late. Investors’ concerns over Twitter are “overdone,” JPMorgan analyst Doug Anmuth wrote in a note to clients Wednesday. Twitter has been hit hard since news broke of the massive Facebook data breach. The stock is down 18% over the past week over fears that, like Facebook, potential regulation could hinder its ability to monetise user data. It closed in the red on Tuesday after Citron Research tweeted that Twitter is the most vulnerable social media company to privacy regulation. But Anmuth said not to flee the stock. “The pullback in Twitter shares on Data Licensing concerns is overdone,” he wrote, citing the way that Twitter actually handles user data. As the EU is set to implement GDPR (General Data Protection Regulation) rules on May 25 this year, and the FTC investigates Facebook, social media companies may have to rethink how they use and sell highly sensitive personal data. But Anmuth said that “Twitter’s application programmers interfaces simply make its already publicly available information more accessible.” In short, Twitter simply makes data sharing easier for advertisers. It doesn’t give those parties inside access to highly personal user data. The note did point out, as did Citron Research’s note Tuesday, that Twitter’s data licensing revenue grew in 2017, while advertising revenue fell. Twitter’s data liscencing revenue grew from $US282 million in 2016 to $US333 million in 2017, while ad revenue for the same period shrunk from $US2.2 billion to $US2.1 billion, according to its 2017 letter to shareholders. 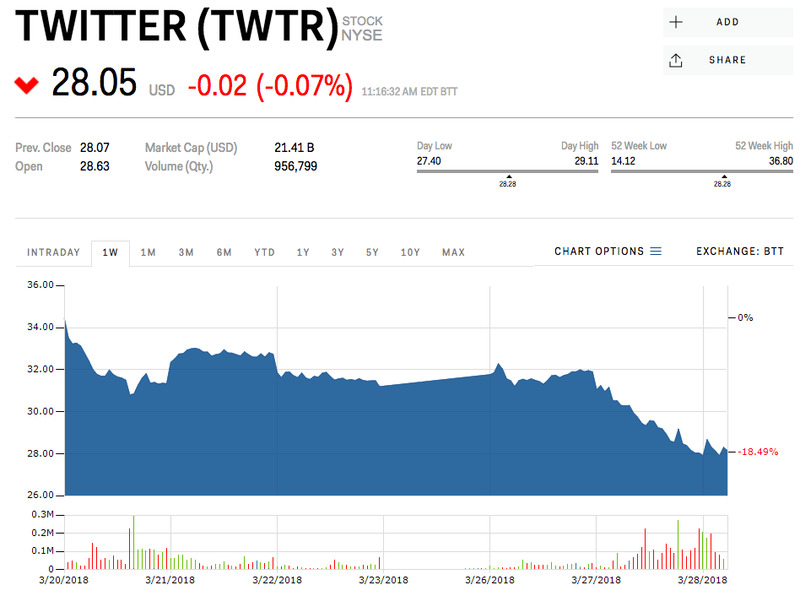 The JPMorgan note said data licencing was “likely 20%+ of EBITDA.” Citron cited this as the reason Twitter is especially vulnerable to data regulation, a conclusion JPMorgan refuted, citing Twitter’s reliance on non-sensitive data, rather than the sensitive data subject to regulation. JPMorgan gave Twitter a $US36 price target, with the stock hovering around $US28 Wednesday. “TWTR’s execution is improving across both products and advertising, which we expect to drive 11% DAU growth in 2018 and accelerating revenue growth of 14%,” the note said.